Great Winter Rates!! Stay our centrally located native Villa which will help you to create your very own vacation memories by enjoying life like a Bahamian while experiencing Nassau. Get away from the crowded hustle and bustle of commercial hotels and relax in a tranquil setting where the tropical winds provide a calming environment. Your villa is uniquely nestled in a quiet neighborhood yet easily accessible to everything. 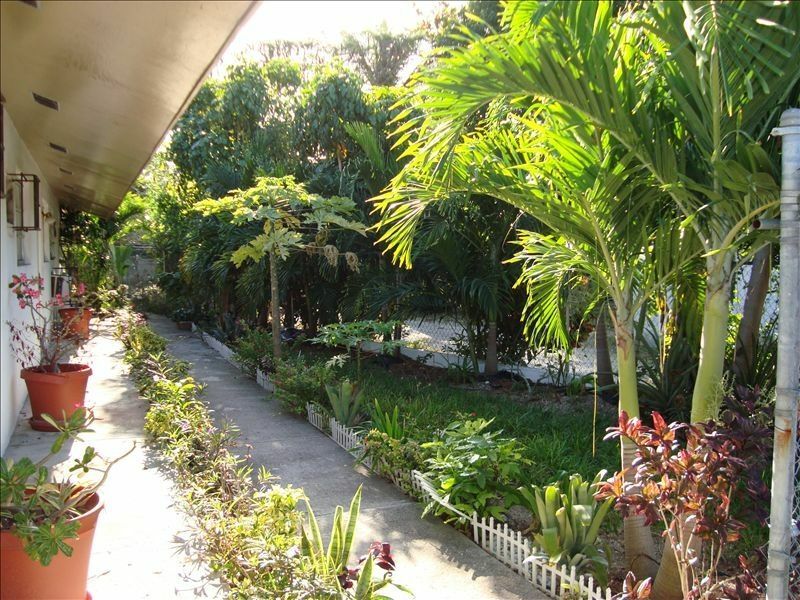 Open the blinds and watch the dawn of each new day as the sunrise kisses the tropical trees located in the breathtaking Botanical Gardens which are literally in your backyard! Walk 25 steps from your backyard and view the Botanical Gardens' 600 species of flowering trees and shrubs. Want a shorter commute to a tropical garden? Then just step outside the front door of the villa and explore within our grounds various plant and flowers. Ready to tour Nassau? Now, casually stroll 100 steps heading east and you will be in Fort Charlotte. Built by British in 1776, a guided tour of Fort Charlotte features a water-less moat, draw-bridge, underground passages and dungeons which recounts slavery and emancipation in The Bahamas. Alternatively, stroll 100 steps heading south and you can tour Popopstudios Centre for the Visual Arts (formerly Dillet’s Guesthouse). The public transportation is only a 3 minutes stroll--$1 heading east takes you to the Straw Market, Downtown Nassau or Atlantis/Paradise Island or take a scenic 15 minute walk and you are in the heart of the Town. While in town visit the Queen’s staircase which was carved out of solid limestone by slaves in the late 18th century between 1793 and 1794. Alternatively, a 7 minutes ride further west of the apartment places you at Cable Beach public 18-hole golf course. Have fun at the world renowned Cable Beach Strip. There are 3 additional beaches for your absolute pleasure. For the nature lover, just 50 feet from your villa you’ll see the Ardastra Gardens, Zoo and Conservation Center which provides a sanctuary and survival center for over 300 exotic birds, mammals and reptiles. It is famous for being home to the world famous marching pink flamingos. This well-maintained, spacious and modern apartment has a fully equipped kitchen and the living and dining are designed with your comfort in mind. This 2-bedroom 1 bathroom apartment can easily be converted to a 1 bedroom/1 bathroom unit. Rest, relax, spoil and pamper yourself. Your package includes transfers from the airport, a 30-minute trip to the food store, free local phone calls and internet access. Ready to feast on Bahamian delicacies? A minute walk takes you to Fish Fry where you will find an array of native restaurants--serving mouthwatering native dishes—cultural music and entertainment. Afterward, relax and unwind at the nearby Arawak Cay white sandy beach or take a short bus ride to Saunders Beach or Cable Beach. Cozy and clean place with all the amenities. Small grocery store around the corner. Several great restaurants and a beach less than 10 min walk. Julie herself gave us a ride to the house and was very responsive to our messages. Would definitely stay here again. My husband and I were very happy to have the owner, Julie, arrange airport pickup, as well as Julie herself, bringing us to the Fresh Market grocery store that evening. (I would recommend taking advantage of this, if you are not renting a car. Buy what you need for the time that you are here). We chose to cook a lot, to save costs and time, (more beach time is wonderful for us), and Julie has all amenities needed for this. We packed a beach lunch daily, plus ate breakfast and some dinners here. We took buses for $1.25 each, or slightly higher for further away beaches, and we would highly recommend this. The bus stop is a 5-8 minute walk, down by the Fish Fry Restaurants,(don't let this name fool you, there are lots of restaurants with good healthier food too there. We enjoyed Twin Brothers). Wait at the bus stop on the L of this Road, (Dunmore/Chippingham), to go West of town, or the one R of this condo road, opposite side of the road, to go into down town Nassau, East of town. We went to 8 different beaches while here, and loved them all. Our favorite ones were Cabbage, on Paradise Island, (we took Matthew, Julie's recommendation for a cab driver there. Plan on $50-$100 for cab trips most places). We loved the Pink Octopus Restaurant for a healthier eating experience. Plan on at least 2 hours there. Luciano's is also an excellent restaurant! We also loved Clifton Heritage Park and had an amazing day there. Try the BBQ, pork and chicken one. If you take a bus to further places like Clifton, plan with the bus driver to pick you up at a certain time. The park closes at 4, but they do have security available after to call a cab for you if needed. Have a good cab number. We used Matthew and felt he was honest and knowledgable. Try to connect with the locals, both walking in this area, as well as on the bus. They love it, and it's a way to learn about their Island. We loved the Ardasta Zoo close by, great for children, but anyone really. Go for the Flamingo Show and enjoy the beautiful foliage. Julie made our stay perfect, by providing linen and towel change for the longer stay. We would stay again here, or at another location with Julie, as she is the best for good service, a clean place to stay, and very reliable contact during our stay. Great little place to stay!!! Loved the house and the value. Julie was great and the place was exactly what we were looking for while we stayed in Nassau. Thanks for helping us have a great time! Stayed here for six nights. Location is perfect. Easy walking distance to Nassau and all it offers. #10 bus to town and Cable Beach minutes walk. Junkanoo beach a few minutes walk. Cricket ground with good food and a game on Sunday again mins walk. Fish fry also an easy stroll. Home itself Bahaman style well maintained and extemely clean with all the amenties . Julie was very accomodating : arranged a pick up and drop off at the airport plus a trip to the supermarket en route which was very welcome as there are none in the local area. All in all a friendly affordable Bahamian accommodation that we highly recommend. Great location and very helpful and accommodating owner! The property was in a great locale close to the fish fry and we felt very safe to walk back and forth in the area. Groceries are very expensive in Nassau, it was fabulous to have Julie drive us to the market for a trip to stock up our first day to help us out! Our family of 4 was very comfortable in the suite and the only thing we really missed was somewhere to sit outside each morning With a bit more space. We would recommend this rental for sure! Another couple, along with my wife and I spent 9 days and had a wonderful time! The location of Julie’s villa apartment is excellent! The Fish Fry, beaches, and downtown are just a few minutes away. Julie’s driver met us at the airport when we arrived and we used his cab service for our entire stay. He was personable, reliable and generously shared many interesting facts about the history and culture of The Bahamas. Julie was a wonderful host. She called to see if we required anything and when we did was quick to respond. We had the opportunity to meet some of Julie’s family who live in the same complex. They too were wonderful hosts. $120/ per night...$780 p/w for 2 bedroom /1 bath...3 night minimum $100/per night...$680 p/w for 1 bedroom/1bath option Rate includes transfer from airport and 30 minute trip to major grocery store $250 refundable damage/security deposit. Cleaning fee $100. Maid service at an additional cost. Pay Pal, Visa and Master Card accepted.